Children dream of finding giant rhinoceros beetles when they scour the hillsides, woods and creeks in search of bugs, tadpoles, lizards, and other creatures. Some are lucky enough to come across the gigantic Eastern Hercules Beetle. Many children have grown but still remember their childhood fascination with the legendary rhinoceros beetles. 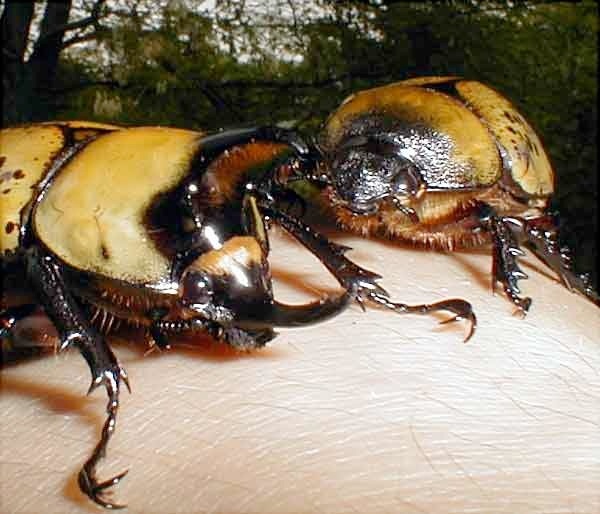 This article is for those young at heart and still enchanted by the wonderful, majestic Eastern Hercules Beetle. 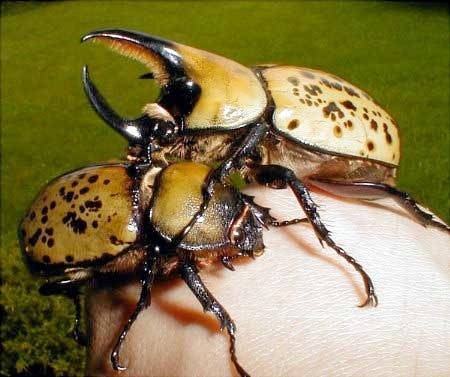 The Eastern Hercules Beetle Dynastes tityus is found in the United States, from New Jersey, south to Florida, and west to Texas. It can be locally common but is difficult to find in most areas; the larvae require giant, old, dead, compost-filled, trees that have been removed from most areas. Adults are active between the months of June and September and fly to bright blue-white lights just after dusk. The relatively plain female possesses only tiny bumps on her head while the flashy male is armed with a huge horn on both the head and dorsal surface of the thorax (middle body segment). The two large horns form a working pincher used in duels over food and females. Up and down movements of the head control the pincher. Although the horns are formidable, fights seldom result in more than superficial damage (scratches and dents). There is a tiny horn on each side of the thoracic horn, which may serve to protect the eyes. D. tityus is one of the most colorful rhinoceros beetles. Adults range from army green to yellow. The elytra are covered in variable maroon to brownish-black spots. They can even change color. The entire body turns nearly black when wet and returns to normal when dry. D. tityus is a member of the order Coleoptera (beetles), family Scarabaeidae (scarabs), subfamily Dynastinae (rhinoceros beetles). Like most creatures, the Eastern Hercules Beetle begins life as an egg. Each ovum is white to yellowish in color and is a little over an eighth of an inch in diameter. The outer shell of the egg is thin, permeable to water and prone to drying out. For this reason, it is important to keep the egg in moist substrate. The adult female is very particular about where she deposits her eggs. She tends only to target tree holes with certain qualities. Tree holes are the hollow centers of very old, often dead or mostly dead, trees that are filled with years of accumulated/composted dead leaves, rotten wood and forest litter. Many of the best tree holes were once home to raccoons or owls that added discarded food and frass to the compost. Unsheltered tree holes are inadequate because of widely varying moisture levels that would either dry out or drown the eggs and larvae. Small tree holes are also not acceptable because they cannot provide enough food for the gigantic grubs. Furthermore, the consistency of the compost inside a tree hole is very important; it must form easily into clumps. In captivity, a tree hole habitat is recreated by placing a mixture of compost manure, crushed rotten wood, and pulverized dead hardwood leaves (1:1:1 ratio) into a five or ten gallon aquarium with a glass or plastic lid. If the substrate is compactable, it is moist enough. Dry substrate is not compactable. Within reason, it's tough to keep them too moist. The make-up and consistency of the substrate is not only important for egg laying, but is also important because the substrate is the grubs' food. A glass or plastic lid is seldom completely airtight and a minuscule gap provides plenty of airflow. Additional holes or vents cause the substrate to dry out. The female deposits a single egg into a large clump of substrate, which she has spent hours compacting with her legs and body. The female has a retractable ovipositor only seen during egg laying. As the egg is laid, the ovipositor creates a cavity twice the diameter of the egg. The extra space is needed because the ovum absorbs moisture and expands as the larva inside develops. Next, the female pushes and packs more dirt over top. She is now finished with her motherly care and goes on to the task of preparing substrate for the next egg. The question of why the egg starts out small and grows after being laid has a simple answer. The event is very strange after all, imagine a bird or reptile egg that triples or quadruples its volume after it is deposited. Thirty to sixty eggs form inside the female late in the pupa stage. She will never produce any more eggs. She cannot duplicate the strategy of long-lived birds that produce only a few, large eggs at a time. She needs to fly in search of a mate and she must fly to find the perfect place to deposit eggs. She cannot afford excess weight. The eggs pick up most of their weight in moisture after being laid which saves the mother from dying of exhaustion before she finds a good place to lay them. A number of beetle species (especially scarabs) employ this strategy. The fertilized egg expands and is full-size in just a few weeks. Interestingly, an infertile ovum may appear the same at first but distinguishes itself, as it doesn't expand noticeably. Near the end of the third week, the spiracles and tips of the larva's jaws can be seen through the transparent shell. Another few days and the egg hatches. The grub is an eating machine. It rapidly consumes the surrounding substrate and grows to hundreds of times its mass in a few short months. To begin, a tiny white larva (about the size of a bb) hatches from the egg after three weeks. This small grub begins to feed on the surrounding substrate and quadruples its size within a week. Two more weeks and the young larva goes through its first molt and the grub's head, which had been only a little over a sixteenth of an inch in diameter, becomes a quarter of an inch across. This second instar larva grows quickly to become the size of a pinkie finger. After six more weeks, the grub molts again and the new head is half an inch across. This third instar larva develops into a monster white grub bigger than a golf ball! Many hobbyists find the monstrous grub every bit as fascinating as the beautiful adult. The larva requires little care but should be dug up and checked-on every month. The first inspection should take place three to four days after hatching. Most difficulties and deaths are seen --and should be watched out for-- during the first instar. The body of a healthy larva is mostly white with a bluish-black or brownish abdomen. If the grub does not appear plump and grow noticeably within the first week after hatching, there is something wrong with the substrate and the larva must be placed in new substrate. During the monthly check-up, if the food appears to be mostly pellets or powder, it should be changed so the grub does not starve. Another reason for a monthly probe is the substrate surface may appear normal but be dangerously dried or soggy within. Lastly, a small handful of dry dog food can be buried in the substrate (for extra nutrition) after each check-up. The time between the last molt and formation of the pupal cell is highly variable. Poor substrate, low temperatures, genetics and overcrowding contribute to lengthening this period. The time required between larval molts is consistent unless conditions are very poor. If quality substrate (food) is not provided, the larva can take years to pupate. Long periods of low temperatures (40F -55F) do not damage the larva but will slow or stop its growth. Larvae from different genetic stocks -- less commonly the same stock-- often pupate at a different time under identical conditions. 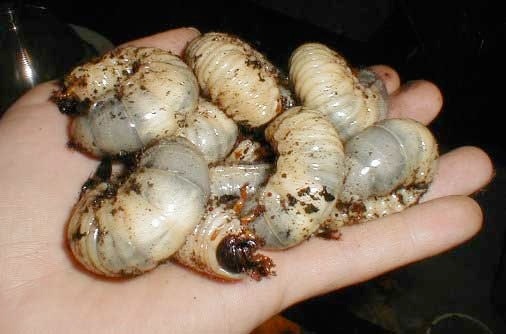 Full-grown grubs should not be kept together at a rate of more than two grubs per gallon of substrate or they may have too little food, damage each other, and disturb each other during pupal cell formation. Depending on the above factors, it may take only four additional months to as long as two more years for the larva to form a pupal cell following the last larval molt. The enormous, full-grown larva gradually changes from white to yellow before pupating. When ready, the grub uses its body and jaws to construct a smooth walled chamber deep in the dirt. This cell is about the size and shape of a chicken egg. Next, inside the pupal cell, the larva begins to shrink and the legs and head become immobile. Finally, after three to four weeks, the grub molts to become a pupa, which looks like a tan, mummified adult. The incredible monster pupa cannot move its legs or head and is only able to wiggle its abdomen. In a few weeks the legs, thorax and head of the pupa begin to darken. Another week and the outer husk collapses and out comes a full-grown beetle. At first, the pronotum is black and the outer wings are white. The elytra turn brown and then, after a week or two, the armor changes to the army green to yellow adult coloration. The young adult is vulnerable for the first few weeks because the carapace takes time to harden. Dropping a new adult or placing it with mature adults frequently leads to abdominal damage and death. Once the shell has hardened, the beetle is exceptionally difficult to harm. Most rhinoceros beetles, including wild-caught D. tityus, only live two to five months as adults. 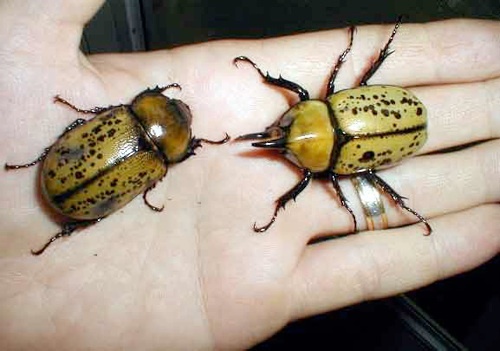 A unique aspect of the Eastern Hercules Beetle is that captive reared adults can be hibernated, which allows them to live ten or eleven months. Placing the cage in a cool area of the basement is usually enough to start newly emerged adults into diapause. The adults can still be handled and are able to walk around while in diapause, but they do not eat, lay eggs or fly. After four to seven months, the beetles finish hibernating and begin to mate, lay eggs and feed on banana slices (and a number of other cut fruits). Another few weeks and they fly. Mating is accomplished by placing a male and female in the same cage for a few days. Mates locate each other easily, even in large cages. Many male insects are known to locate a female by following her pheromone trail to the source. However, it seems female D. tityus find the males. In the wild, adult male D. tityus emerge first and congregate on very specific trees (i.e. there may be hundreds of Ash trees in an area and all the adults are found on just one). It is uncertain if there is a "congregation pheromone" or if there is something unique about the tree. The same tree is not always used which suggests a pheromone. In captivity, females spend most of their time underground. The male's horns get in the way of digging so he has limited ability to chase her under the substrate. Unmated females surface each night in search of a male while mated females remain in the substrate. (Mated females may spend much time on the surface if the substrate is too poor for egg laying). It is thrilling to hear the loud buzzing flight while at the same time watching the giant Eastern Hercules Beetle as it comes to a crash landing outside a gas station. It is even more exciting, however, to watch this amazing beetle grow and transform from a tiny egg into one of the most massive North American insects. The photos of this gorgeous beetle --included in this article-- should be more than enough proof of the rewards of keeping and rearing this magnificent creature. Additional information about keeping adults from Orin - Adults may be kept in any container from deli cups to 10 gallon aquariums. They are kept at room temperature but can tolerate temperatures from 95F down to 40F. Their cage needs only substrate. Any other decoration is for the keepers enjoyment and is not necessary. The beetles get their fluids from their fruit foods.